On Ground L to R: Margaret Dunabie, Anne Kerr, Margaret Watson, Front Row, seated L to R Janet Steel, Janet Wyllie, Isabella Henderson, Monica Irvine, Mary Bell, Alison Houston, Christine Burns, Betty McPherson, Elma McWhirter, Norma McCombe. Front Row Standing L to R: Herbert Kay, Danny Hogg, Ken Marr, Jimmy Andrew, Leslie Hunter, Tom Cook, Hugh Crombie: Middle Row Standing; L to R; Marion McKissock, Margaret Ross, David Imrie, Roy Scobie, John Campbell, Tom McQuiston Catherine Greenlaw, Anne McCulloch. Back Row Standing L to R; Allan McQuater, Jack Johnson, David Rodger, George Davidson, Ian Maltman, Ian McCrindle, Arthur Hunter. 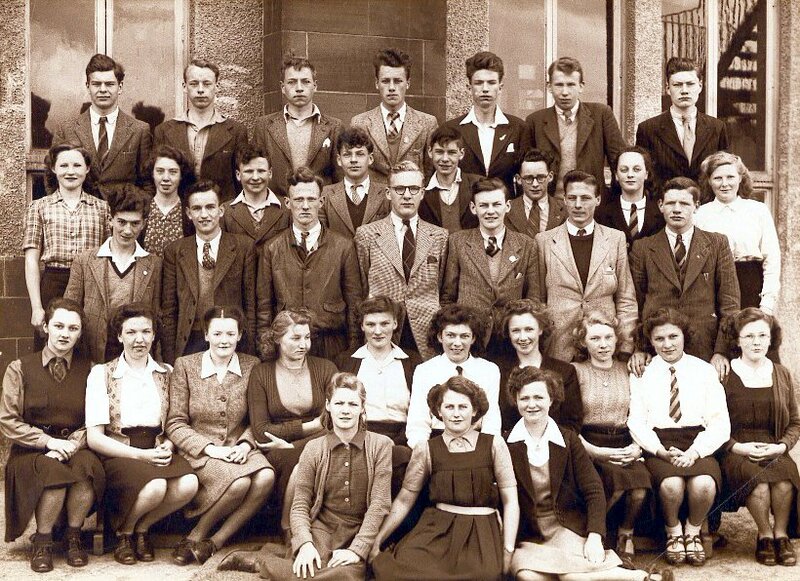 This photo contributed by Herbert Kay who is first on the left in the third row from the front.